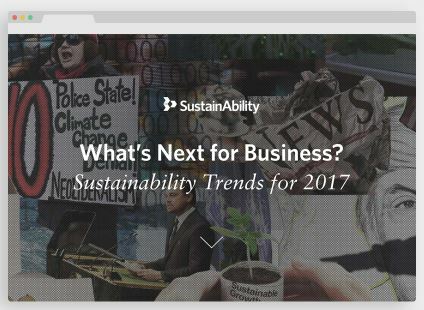 For SustainAbility’s annual trends report, the firm has identified ​10 issues that they believe have the greatest sustainability influence right now, calling out implications for the private sector in particular. 2016 brought profound global ​shifts including rising support for protectionism and populism, growing cybercrime and​ shifting global climate leadership, all​ amid significant political and economic instability. Hey Buddy!, I found this information for you: "What’s Next for Business? Sustainability Trends for 2017". Here is the website link: https://www.duurzaam-ondernemen.nl/whats-next-business-sustainability-trends-2017/. Thank you.